Statement by SEK (Socialist Workers Party), Greece, on the elections, the re-election of Syriza and the coming resistance to austerity. After the elections: We can strengthen the workers’ resistance! 1. The results of the elections of September 20 have not halted the political crisis that has characterized the situation in Greece in recent years, as people will continue to massively resist the memorandum offensive. The assertion that the people “voted for a pro-memorandum policy” is pure and extreme tampering. The new coalition government of SYRIZA with ANEL is commencing the implementation of the third Memorandum from a weaker starting point. On the opposite side the working class’ resistance can count on the support of a stronger left opposition. The possibilities to stem the tide of attacks on the working class stand before us stronger than they were up till now. 2. SYRIZA won the elections, but at the same time it lost about 300,000 voters, at least half of whom have moved leftwards, while a large part chose to abstain. The rise of abstention is not a sign of “conservatism and prevalence of the apolitical”. On the contrary a large part is due to practical transportation difficulties of unemployed and poor voters, who were asked to travel for the third time within a year. This fact is complemented by the fury against the political system which by no means expresses a pro-memorandum mood. Even in terms of parliamentary logic, a government majority of 155 is more limited and more vulnerable to new revolts against the adoption of the tough measures of the third Memorandum. Such revolts remain possible for two reasons. 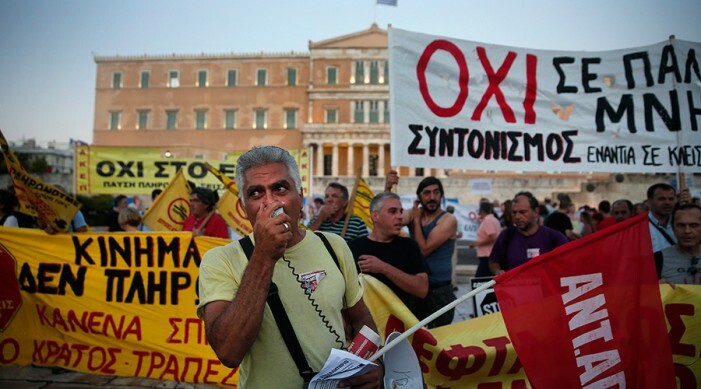 Firstly the crisis inside the party of SYRIZA did not end with the departure of Popular Unity. There are still parts of the party that frown at the course of his leadership. Secondly, and more importantly, the party’s rank and file who come from the working class and voted for Syriza, did it because of the blackmailing threat of the Tories (New Democracy) and thier return to power and they did it with less illusions about Syriza’s program. SYRIZA is a party of the reformist left, a party with a working basis but with a leadership that is firmly aligned with the choices of the ruling class. This alignment is now more visible and palpable after its commitments towards local and foreign lenders. At the same time, people in working class neighbourhoods ,which are important and where SYRIZA came first at the elections, have not applauded these commitments to the memorandum. On the contrary they have demonstrated in every possible way their opposition. The most obvious example was the massive vote for the NO. In order to reclaim the vote of these people, Alexis Tsipras campaigned using two arguments: the promise that the compromise with the memorandums is going to be temporary and the fact that he remains the main opponent of those who forced him to settle. Though he launched his campaign by saying that Syriza would now be more down to earth, in the final stretch he spoke about the new battles that he will give to soften the measures and about negotiating rigorously for debt relief. These promises have no real basis. The international economic situation is deteriorating, as it has been demonstrated by the crisis in China. The first statements of the “institutions” of the EU and the IMF on debt talk about “alleviations” that would mean that the Greek government will have to pay 15% of its GDP (!) to reimburse it. Believing in Tsipras’ promises is illusionary. But Tsipras will have to deal with these expectations, and this will be harder than it was till now. Both the analysis of surveys and exit-polls, and the real experiences from discussions at workplaces converge to estimate that many of those who oscillated between SYRIZA and the other forces of the Left chose to vote Syriza coldheartedly and from a perspective of anti-Tories tactics. Opinion polls that were predicting a “derby” between SYRIZA-ND were proved wrong once again, but in the meantime they played a role. In January they estimated that the gap was supposedly narrowing down, but in reality it finally reached 8.5 per cent. In the referendum they were predicting a marginal lead of the YES, but the NO finally triumphed. This time they tried to impel people towards voting Syriza by highlighting the threatening dilemma posed by Tsipras between “the old and the new”. The people who abided to this threat have fewer ties with SYRIZA today than they had in January. Back then, they wouldn’t accept any critique about the government of the Left. Today, it is them who criticise its limits. 3. The new government of Tsipras and Kammenos cannot easily count on the support of the 222 MPs of the previous parliament who voted for the third memorandum. New Democracy has been defeated for the third time within a few months and tensions created by their domestic disputes are already surfacing. All of New Democracy’s wings start with a good word for Meimarakis’ leadership, which did its best to unify the different tendencies. But we are a few days after the elections, and half of them are already requiring a return to the tough opposition stance expressed through the politics of the “parenthesis of the Left” tactics and the other half want to continue addressing governmental cooperation invitations to SYRIZA.Samaras’ wing tried again and again to scare people not to vote for the left and it failed. Meimarakis declarations for the “party of Concord and not of Discord” did not deliver the expected results. Meeting halfway does not seem to be easily feasible and this has two consequences: firstly, the division will be exacerbated as the measures of the third Memorandum will be brought to the Parliament and secondly, the left opposition will be able to benefit from the crisis of the right.The ideological bankruptcy of the European Union is becoming massively visible in the eyes of millions, as an institution not only of austerity and memoranda but also of racism against the wave of refugees, and this is exacerbating the impasses of its traditional supporters. This will be one of the problems for the ruling class in the coming period. 4. This gap is not filled in by the powers of the centre and the “centre-left”. The rise recorded for PASOK and DIMAR are counterbalanced by the losses suffered by Potami. The showdown for hegemony in the space of the centre between them, has been proven a “zero-sum” game and neither of them has managed to emerge as a strong pole. The political space of the centre cannot be a dynamic one within a period of harsh class polarization and this translates into disruptive trends for Potami. For PASOK on the other hand it means determining its politics according to the outcome of New Democracy’s crisis: It is either to be a tough either a “creative” opposition depending on the chances created by New Democracy’s choices. As for the enlargement of this space with Leventis’ forces, well any such approach would be the quickest road to further caricature the “centre”. 5. The real issue put on the table the day after the elections, is whether and how the Left beyond SYRIZA will be able to seize the existing opportunities.The 150,000 votes won by Popular Unity are an undeniable support for the left opposition. The sum of the percentages of the Communist Party, of P.U., of ANTARSYA and other extra-parliamentary left organizations reaches 9.46%. It is an impressive figure in a situation where SYRIZA is in government. There is no other country in a similar situation. We need to look back to earlier periods if we want to find historical examples where the resentment towards a government of the left is driven towards other forces of the left. But beyond and above the electoral presence is the involvement of all these people in the battles to come. There is a real potential to transform each work place, that will be hit by the new memorandum attacks, into a fortress of resistance. The battles that the workers of ERT gave when the government of Samaras and Venizelos shut the public national broadcaster down can be repeated by the Dockers, the workers of the Public Provider of Electricity(ΔΕΗ), at every hospital and school while having at their side a broad solidarity movement with the support not only of the Left beyond SYRIZA but also of a large part of the people who voted for Syriza. The same applies to the battles against the fascists in order to defend refugees and immigrants. To organize, however, we need to reject the defeatism of traditional leaderships and tackle the strategic issues that pressingly come to the fore -The KKE leadership holds responsibility for failing to reinforce the wave of departures from SYRIZA. The tactics of continuous denunciations along with the systematic denial of any common action have raised walls instead of winning the people who seek a support from the left and who need a perspective. The choice of abstention and spoiled vote in the referendum have obviously not helped. This passing the buck elsewhere and painting a picture where the left must barricade itself amidst a hostile environment becomes quite problematic. Popular Unity’s leadership did not meet the expectations of the people who were embittered by SYRIZA’s compromises. A trend that represented 30% of organized SYRIZA members and was aiming to become a majority in the next Congress found itself rallying a small fraction of voters and consequently remaining out of parliament. But this fact should not be a cause of frustration and defeatism. Part of the explanation lies in the arrogance shown towards the rest of the left. There was no real effort to show that P.U. is a more unifying force than the leadership of the Communist Party. Towards ANTARSYA, it preferred a little split than a sincere dialogue. The most important problem though, is the incomplete break with SYRIZA’s strategy. Rather than bringing a different approach to the issues of conflict with the system that generates crises and memorandums, P.U. focused on looking for a pragmatic governmental program of a “real” future government of the left. This left them in the middle of nowhere: there was no prospect of becoming government, nor did it open up new perspectives for the current battles of the movement. The debate on the anti-capitalist strategy, along with the common action, is indispensable for the battles ahead. 6. So one of the first battles to be fought is the development of an anti-fascist movement against the neo-Nazi gang of Golden Dawn. The election results do not record a rise for GD: it got fewer votes and it marginally increased its percentage due to the rate of abstinence. In fact, the number of votes in the big cities has decreased significantly and it is counterbalanced only partly by the rise in conservative rural and tourist areas. This is despite the fact that they were bolstered numerous times: They received judicial and parliamentary facilitations in order to avoid trial and to appear in parliament as another ordinary party. Mihaloliakos was “exhibited” on the eve of elections by Hatzinikolaou that gave him the opportunity to this fascist to liken himself with Karamanlis and Mitsotakis who were never tried for the murders of Lambrakis and Temponeras. And of course, we must not forget the racist policies of the EU towards refugees that create the necessary space for the far right to present itself as the highest bidder in islamophobic hysteria everywhere. Nevertheless, the “theory” that Golden Dawn would be the main beneficiary of the crisis of SYRIZA was not confirmed. Such automations do not actually apply. The anti-fascist movement’s action can make a difference. The antifascists that came out again and again in the streets, outside the trial in Korydallos, in the centre of Piraeus, on the anniversary of Pavlos Fyssas and against every attack of their battalion squads, point out clearly the tasks that the Left must take up in the coming period. 7. ANTARSYA, the anti-capitalist left, comes out of the electoral battle as a force that can clearly contribute to the development of workers’ resistance at all levels. Despite the blow it took at the start of the pre-election period by the choice of the leaderships of ARAN and ARAS to leave and join P.U, it managed to gain in votes as well as in percentage. ANTARSYA owes this above all to the thousands of comrades who organized an impressive presence with hundreds of meetings in workplaces and neighbourhoods. These constitute a real legacy for the stretching of anticapitalist ideas and action there where the working class and the youth work, study and fight. ANTARSYA also owes this to the united stance that it has kept during all the fights, large and small, that shaped the leftwards trend over the previous period. Despite the internal tensions and disagreements which kept it back for a long time, it never faced struggles in a sectarian way. Through the initiatives of the “Coordination against Closures and Availability” ANTARSYA was present in every solidarity movement. Through the initiatives of KEERFA, ANTARSYA supported the anti-fascist and anti-racist movement. Particularly in the battle of the referendum it showed in practice in each and everyone who fight against compromises that they may count on ANTARSYA. ANTARSYA also showed that it can cooperate electorally when such terms arise as it did with EEK. Above all, however, ANTARSYA stands out for its contribution to the great debate about subversive strategies which is becoming urgently relevant today. Each passing day proves that the memoranda, austerity and racism cannot be confronted thanks to a few members of the Left who will become ministers. The question of how we move beyond the limits of a government administration that stumbles upon the blackmails of the ruling classes and their mechanisms, national and supranational, becomes tangible and it concerns thousand of fighters of the working class and the left. The answers of the anticapitalist strategy are valuable and strengthening ANTARSYA is necessary. With this orientation, ANTARSYA is going towards its -so much delayed- third Conference. The Socialist Workers Party (SEK) will contribute to such a course so as to make, the next period of working class resistance, a victorious one.